Charlotte is now a major business hub in the balmy and friendly Southeast. Outside the Southland everyone thinks the food scene remains a fatty smorgasbord of shrimp and grits, fried chicken, buttery biscuits, and greens cooked down with a slab of fatback in the pot. The beauty of Charlotte’s cuisine is that these wonderful flavors are revamped and renovated in totally unheard of ways, thanks to next generation chefs with passion and vision. The result is ingredient-driven upscale menus that fuse a dizzying array of flavors and elements. Even better is that until recently much of the new cooking going on in the area has gone undetected by the outside world and it’s great—excellent restaurants and talented local chefs. 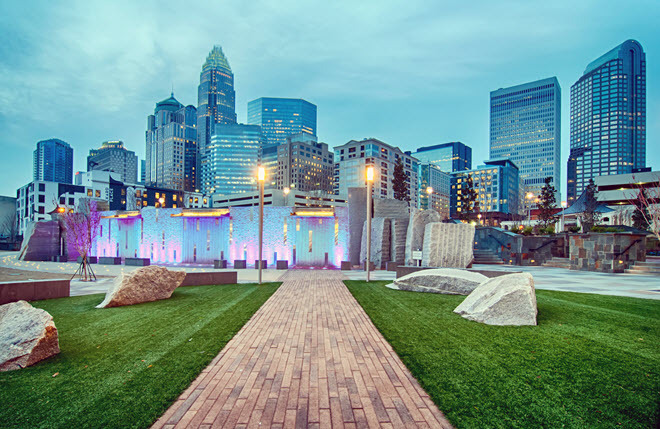 Add in the cultural diversity that also has come to pass in Charlotte and you can whet your tastebuds for a wide range of flavors and dishes, from Spanish tapas, to southern soul food, contemporary American, Italian and Asian fusion. What types of culinary degrees are available? Can you study full-time, part-time, day or evening? What kind of time investment is required? Do you get career services, such as help with resume and job placement? Does the school offer scholarships and/or financial aid? Check out the Charlotte schools that will get you on the career track to a passionate life. This very unique culinary academy actually specializes in training students with particular challenges. In fact the school’s motto is: “Training in the culinary arts for chronically underemployed adults.” Don’t let this mislead you: the Community Culinary School is not the easy road to a slacker job in a restaurant kitchen. You must pursue this career opportunity with gusto. This liberal arts university delivers one of the most comprehensive culinary educations around. For decades the theory behind JWU has been to teach the whole chef, give him or her all the tools they will need to succeed, which includes the traditional liberal arts coursework along with the exciting cooking stuff. The International Culinary Schools are among the most well-recognized and popular with locations convenient to most major metro areas across the country. You work alongside other students in small groups, in state-of-the-art kitchens. Curriculum covers the elements of international cuisines, and with your passion and vision you bring the rest. You learn how to work the knives like the pros, plus how to portion food, control kitchen costs, various cooking techniques, sanitation, and how to plate and present. Degree programs include: Associates of Applied Science in Culinary Arts and Bachelor of Arts in Culinary Arts Management.